Contrary to popular belief hemp was not banned in the United States in 1937. Yes, the Marihuana Tax Act was passed and hemp was taxed and highly regulated, but hemp was legally grown in this country until 1957 and here is the story. This is a wonderful, self-published book and video that documents the Rens Hemp Company from the family's perspective. Highly recommended! To order the 41 page book (with many never before seen pictures) and video (a short documentary of hemp harvesting from 1940 in black & white and color) please email Dennis Rens for current prices and to order it directly from him. For a review of this book please see: Book Reviews - America's Hemp King and scroll down, it is the third review. Note, we do not receive a percentage of this sale. It is a wonderful family history and this is why it has top billing on this page. There is a very nice section on Industrial Hemp by Lyster H. Dewey. By James F. Hopkins, Lexington, KY, University of Kentucky Press, 1951. 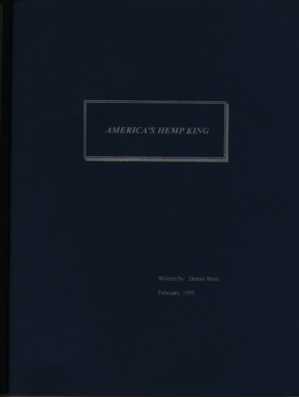 For an excellent review of A History of the Hemp Industry in Kentucky see Dr. Dave West's Histories of Hemp which also tells the story of how this book came to be reprinted. The article "The New Billion Dollar Crop" is in this issue. By James Lane Allen, MacMillan; NY: 1900. Very nice hemp design on the cover and spine. By Ernest Small, Corpus, Toronto, 1979. A.H. Wright, Bulletin 293, May 1918, Agricultural Experiment Station of the University of Wisconsin.